Construction continues on the 2015 roller coaster at Busch Gardens Williamsburg. Clint and Braedon check in to show off the construction, look at some other ride construction going on at the Flum, and show off Rum Spiced Bacon! 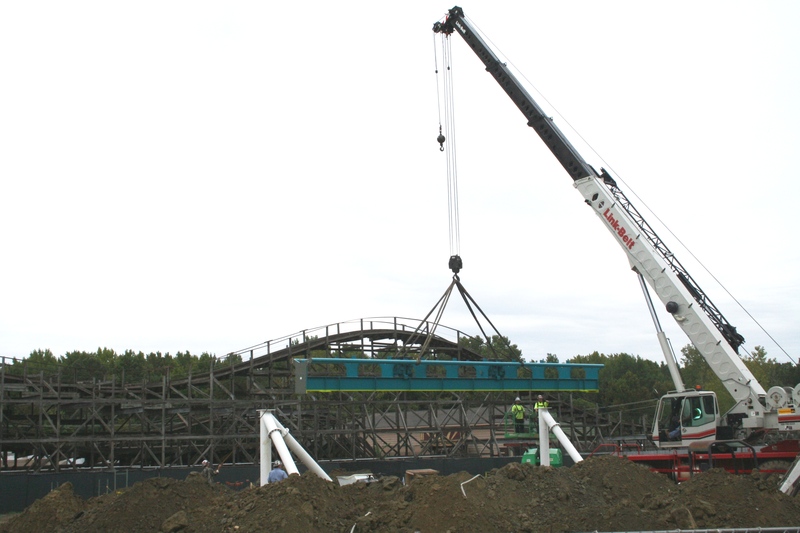 The nation’s first launched wing coaster hits a milestone today, as the highest piece of track is lifted into place by a 165-foot-tall crane. The original plans for Cedar Point’s Mantis roller coaster was to close is down on October 19th as they start its transition to the new floorless coaster Rougarou, but those plans have changed. Cedar Point officials say the stand-up coaster will remain open for the remainder of HalloWeekends. The coaster has already started its Rougarou transformation. Some sections of the coaster have been painted. EDIT: According to Cedar Points Facebook Page the coaster will still close on the 19th. It will however be open on Fridays before the 19th. Laff Trakk construction at Hersheypark is well underway with what looks to be the ride building foundation being put together and ready to be poured. All American Thrills flew there drone 200 feet up to check out the current site. Danielle heads up to Scarowinds to have some Halloween fun. While she was up there she showed off the new parking booth’s, and the current construction of Fury 325 a day before steel went in to place. She gives us a quick peak at a field of track and footers.